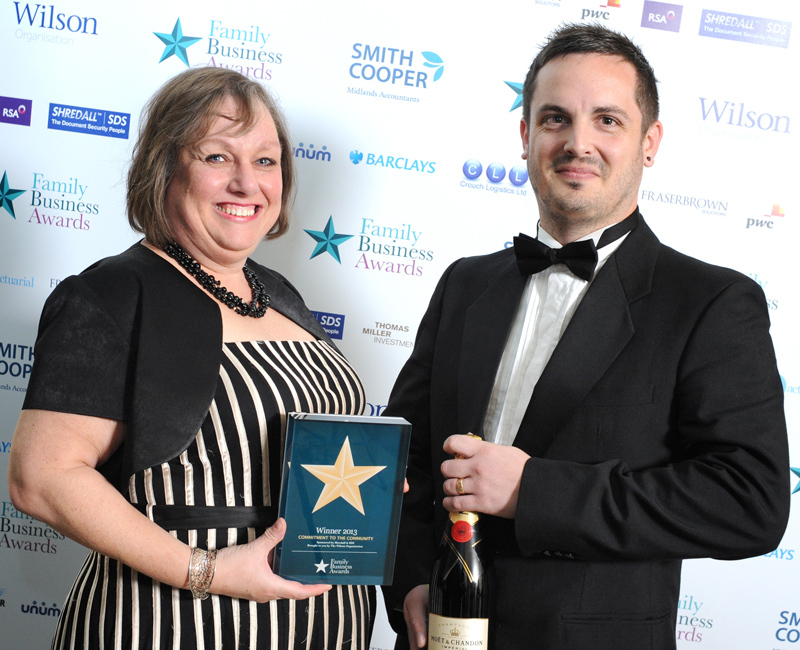 Robert Woodhead Ltd, the Nottinghamshire based Construction Company, were worthy winners of the Commitment to the Community Award at the Midlands Family Business Awards held on 14 November 2013. With over 300 guests, the independent Family Business Awards took place at the University of Birmingham’s Great Hall with a prestigious black-tie dinner. As a family business, Robert Woodhead Ltd had plenty of the family at the event to collect the award including Hilary Cheshire (Company Financial Director and sister of David Woodhead, the Managing Director), Tom Woodhead (Continuous Improvement Manager) and Margaret Woodhead (mother of David and Hilary). The award was presented by the sponsors, Shredall & SDS, to Woodhead family members. The Commitment to the Community Award recognises family businesses that make a difference in the areas they operate. Robert Woodhead is committed to delivering social economic and environmental value on their projects. This is not just limited to neighbours next to building sites but it is about bringing benefits to the wider community. Robert Woodhead were commended by the judging panel for their overall approach to corporate social responsibility, recognising that supporting communities is not just about financial support, it involved much more. Their community activities are phenomenal and reflect a thoughtful and considered approach in order to achieve the maximum results. Framework Housing benefited from a number of initiatives supported by Robert Woodhead including an educational resource for Primary School Teachers and a number of other fundraising activities. The company continues to be an active supporter and fundraiser for the Framework Housing charity and is one of the many examples of the company’s contribution to the community. Robert Woodhead Ltd actively supports a number of community programmes. From supporting the Mansfield and Ashfield Career Champions where they have agreed to work with Young people to provide them with employability skills and added career support, through to helping to restore derelict properties into homes for ex-service families to live in, in Pleasley. This was an initiative by Houses2Homes, which the company supported.